Now that such grim confessions and imaginings of possible retribution are done, let’s turn to a far more enjoyable form of self-revelation by an undisputed master of the art. 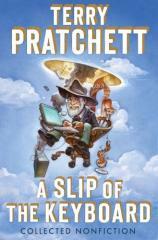 Pratchett’s A SLIP OF THE KEYBOARD is a long-overdue memoir of prose delicacies on a subject he knows better than 99.999% of the world’s population (maybe other worlds as well): how to be Terry Pratchett. In fact, being oneself as an insanely famous and admired writer of clever and sensitive fiction is no easy task; if anything, it makes the finest writers more humanly humble and creates egomaniacal monsters of the 15-minute fame types. Right from the start, however, anyone with even the slightest brush against fantasy fandom will know that Sir Terry (holder of a well-earned knighthood) is of the former species. "...a monumentally fine preservation of material too many writers and readers throw away, 'ephemera' lost forever that contain the real star-stuff of insight and substance. Happily, this memoir is a legacy of lighthearted profundity that could only come from the fertile mind of Terry Pratchett." Unlike many memoirs, A SLIP OF THE KEYBOARD isn’t a continuous start-to-finish reminiscence of what it was like to grow up in 1950s small-town England, being enthralled with pulp magazine stories, consumed by writer’s itch, working one’s way through various journalism and public relations jobs, and, after striving for years to get it right, suddenly awakening to “overnight” success. All that more or less happened, of course (or I couldn’t write about it here), but in Pratchett’s world, time is an endlessly convoluted and elastic medium where past, present and future typically converge in brilliant imagery and turns of phrase. So instead of sitting down to compose an A to Z Story of My Life, he’s drawn together a rich compilation of what are often called “ephemerals” in literature --- short speeches, off-the-cuff reflections, newspaper articles, introductions, rants, reviews, impromptus, impassioned promotions of worthy causes, offbeat humor, and prose for which there doesn’t need to be a name because it’s just a darned good read anyway. To give some semblance of normality and civility to the whole enterprise, A SLIP OF THE KEYBOARD is divided into three roughly thematic sections whose titles aptly suggest the mood and/or gravitas of their contents: A Scribbling Intruder (fun, eclectic, clever, satirical, bizarre); A Twit and a Dreamer (self-deprecating, quizzical, reflective, appreciative, admiring of others, nostalgic); and Days of Rage (serious, activist, caring, angry, fearful, cautionary, moving, emotional). And Finally --- that’s what he calls the last few pages --- some hilarious bits and pieces that don’t quite fit anywhere, but really do belong to the book as a whole. So in the crudest possible terms, A SLIP OF THE KEYBOARD is a 300-page tour de force of recycling. However, I choose to see it as a monumentally fine preservation of material too many writers and readers throw away, “ephemera” lost forever that contain the real star-stuff of insight and substance. Happily, this memoir is a legacy of lighthearted profundity that could only come from the fertile mind of Terry Pratchett. Thank him by reading it!